3 March: ‘We must have contingency plans’ wrote Margaret Thatcher on seeing reports of planned Argentine seizure of the Malvinas. 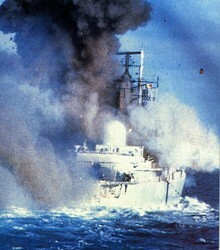 8 March: Thatcher asked Nott how long it would take for Navy ships to reach the Falklands. 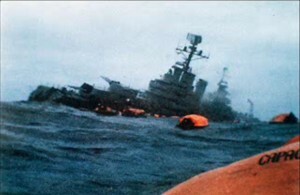 19 March: Argentine flag hoisted on Falklands by scrap metal workers. 20 March: UK delegates to Mauritius, suddenly offering Diego Garcia ex-inhabitants compensation for UK having forcibly exiled them, having done nothinbg for 17 years. 27 March: Deal settled and signed with Diego Garcia natives, 4 million pounds, for taking away their island. 1 April: Sir Anthony Parsons, the British Ambassador at the United Nations, spoke in the Security Council and warned of the imminent danger of an invasion of the Falkland Islands. 2 April: A chaotic invasion then happened the next day, hardly planned by the Argentine government. 5 April: Fleet leaves Portsmouth. 19 April: The three nuclear submarines including Conqueror arrive in the Falkands area. Argentines make peace proposal on basis of UN Resolution 502, for mutual withdrawal of forces form the Malvinas. 26 April: UN Secretary-General announced that Resolution 502 in respect of withdrawal of troops, applied from that moment to the United Kingdom as well as to the Argentine. 27 April: The Haig Memorandum using the 19 April Argentinian proposals and the British conditions. 29 April: Evening US Senate votes for ‘tilt’ towards UK. Carrier Battle Group arrives off Falkands. Friday 30 April: Total Exclusion Zone comes into force, with 200 mile radius around Falkland Islands; soon after which, the War Cabinet decide to sink the aircraft carrier Vincente de Mayo outside the TEZ. 11 am Washington: Hague announces failure and termination of his diplomatic mission, and ‘tilt’ of US towards the UK. It is no longer a neutral mediator. c. 2 pm Lima time: Arias Stella (Peru foreign minister) initiates Peruvian peace plan negotiations, via US ambassador in Lima. 4 pm SAT: the Conqueror detects the signature of the Belgrano and her escorts and advises Northwood. Evening: Foreign Secretary Francis Pym and the Attorney General together in Whitehall compose a Minute for the PM, on illegality of sinking the aircraft carrier outside TEZ, under the UN Article 51. It is sent the next day and ignored. 4.23 am SAT: British Vulcan bombers commence attack upon Port Stanley, followed by Sea Harrier air raids. 8 am SAT: Nuclear sub HMS Conqueror arrives in area, locates trio of ex-US cruiser Belgrano (with no ASW capability and no sonar – a sitting duck) and two old destroyers. 1 am SAT (5 am BST): Confirmation from Beunos Aires Naval Command of return of Argentine fleet; intercepted and relayed back to GCHQ in Cheltenham. 1.30 am SAT, (23.30 Lima time, 5.30 am BST): Belaunde phones Galtieri, telling him he requires a decision re peace plan by 8 am (10 am Washington time). Prior to that, Belaunde had called Haig with the germ of a peace plan using Haig’s seven points slightly modified. British ambassador Wallace relays info to UK (G&R96). 4 am SAT (8 am BST): Sandy Woodward head of Task Force sends instruction to Conqueror to sink Belgrano. 4.30 am SAT (8.30 am BST): Belgrano reverses course, going home. 5 am SAT (9 am BST): Lewin calls at Navy Battle Headquarters Northwood and is told of Belgrano’s sighting the previous day. 6.15 am SAT (10.15 am BST): Northwoods instructs Conqueror not to attack Belgrano. 9.15 am SAT (1.15 pm BST): Permission to sink anything given by ‘War Cabinet’ at Chequers to Lord Lewin – kept a secret for two years, until MOD documents were leaked to Dalyell. 10 am SAT, (2pm BST, 8 am Lima): Belaunde rings Galtieri and is put over to Costa Mendez to discuss peace plan. 10am SAT (1400 GMT): Conqueror reports reversal of Belgrano’s course to Northwood. 11-12 am SAT (9-10 am Washington time): Pym in Washington is informed of the new carte blanche ‘sink anything’ policy, by phone from London. 12am-2pm SAT (10-12 am Washington time, 4-6 pm BST) Pym has breakfast with Haig; Peru’s Prime Minster Ulloa phones and begs Haig for a 24 hour truce. 2 pm SAT (6 pm BST): Conqueror receives orders to sink the Belgrano. 6.30 SAT (4.30 pm Lima Peru): Belaunde holds televised press conference announcing that peace was imminent and would be ratified that evening by the military committee at Buenos Aires (10.50pm BST). 6.30 pm Lima (12.30 pm BST): Ambassadors of UK and Argentina arrive in Lima, presumably to sign peace treaty, are told the news and go home. 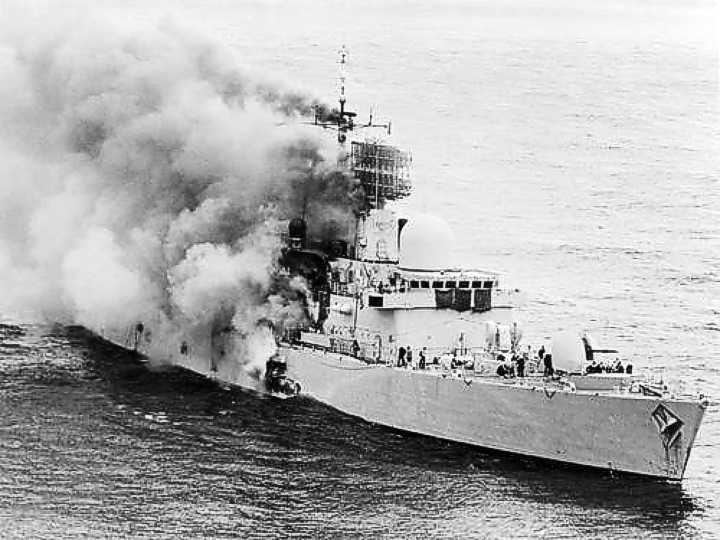 7.15pm SAT (11.15 pm BST): Britain claims first notice of Peruvian peace plan is received, 3 hours after sinking of Belgrano. Absent from our Timeline, is the moment when Thatcher first heard of the Peruvian peace plans. According to Tam Dalyell, ”The brutal truth is that on or near her waking hour that Sunday morning, 2 May, the Prime minister was confronted by messages of serious peace proposals emanating from the United States and Peru, based on what was happening in Argentina. Over a period of at least five hours she deliberately and knowingly elected to create an incident of predictably dreadful proportions.’ (House of Commons 21.12.82, TT p.23) Her waking up in the morning corresponds to midnight in Peru. Not until 15-16 hours after that, did the UK Government admit to its having heard of the Peruvian peace plans: three hours after the sinking. Dalyell surely has to be correct on this matter. For Diana Gould’s statement of the ‘fourteen hours’ from that midnight hour (in Peru) until the sinking of the Belgrano, see here. A Video also illustrates that 14-hour period. Monday May 3 (6 am SAT): Conqueror returns to the site, to finish off the job in case the Belgrano had not properly sunk, but can find nothing. TimeZones: South Atlantic Time is 4 hours behind British summer time. Peruvian/Washington time is 6 hours behind.